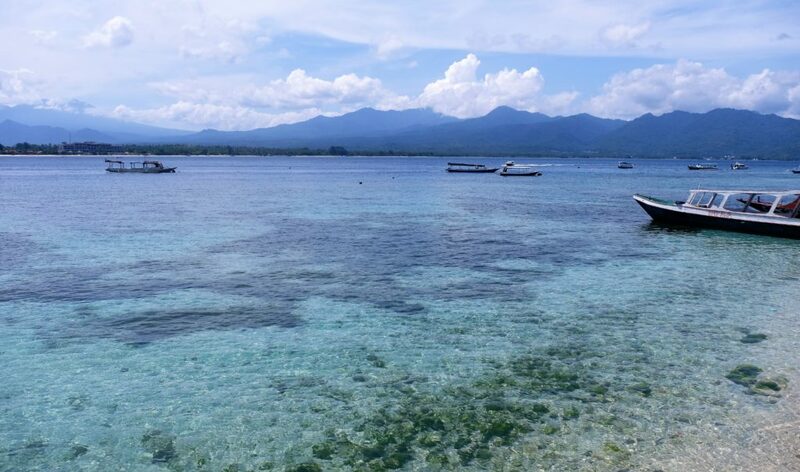 A few days on Gili Air to chill on the beach and swim in the sea before heading off to Lombok seemed like something the doctor would recommend, so I did, and stayed for a week! 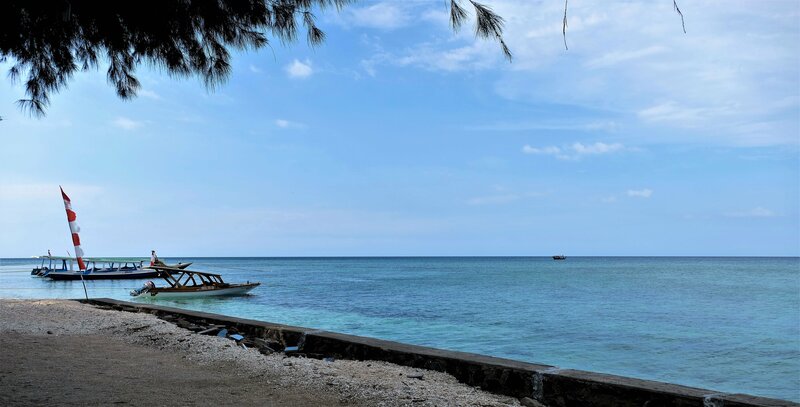 A very short ferry ride from Amed Beach goes straight to the Gili Islands, of which there are three: Gili Trawangan, Gili Meno and Gili Air each with their own uniqueness, style and vibe. 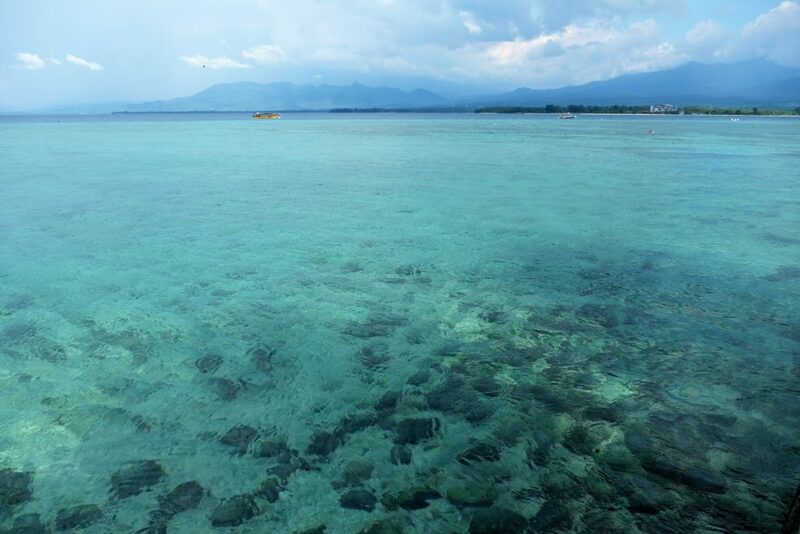 Gili Islands lie off the North West coast of Lombok, and not too far from Bali either. 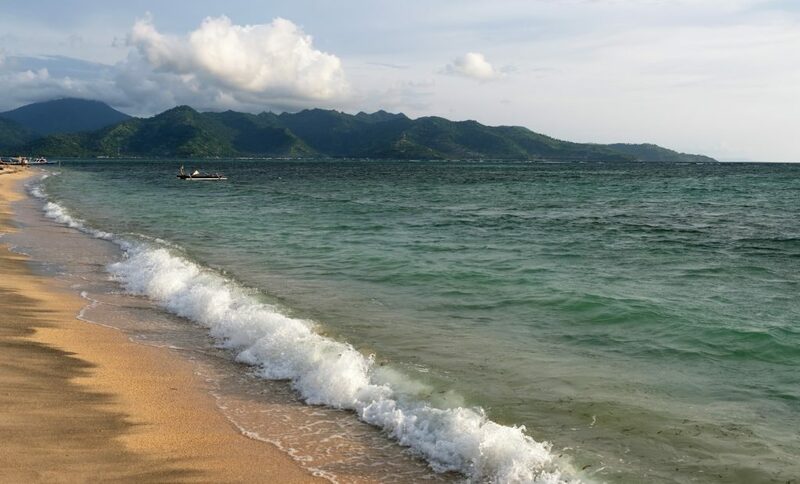 The islands are a stone throw away from each other and Lombok; standing on the beach of either you can see all the islands, Lombok and Bali. 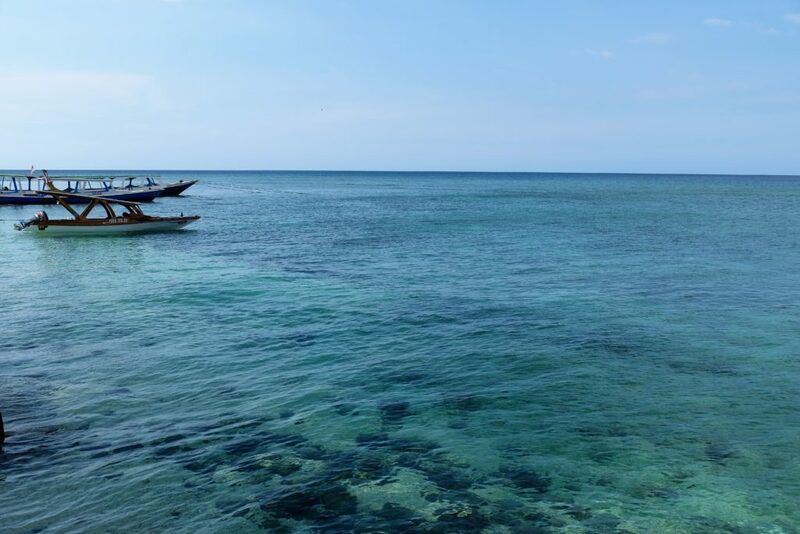 It would be a challenge, but you could swim from Lombok to Gili Air. 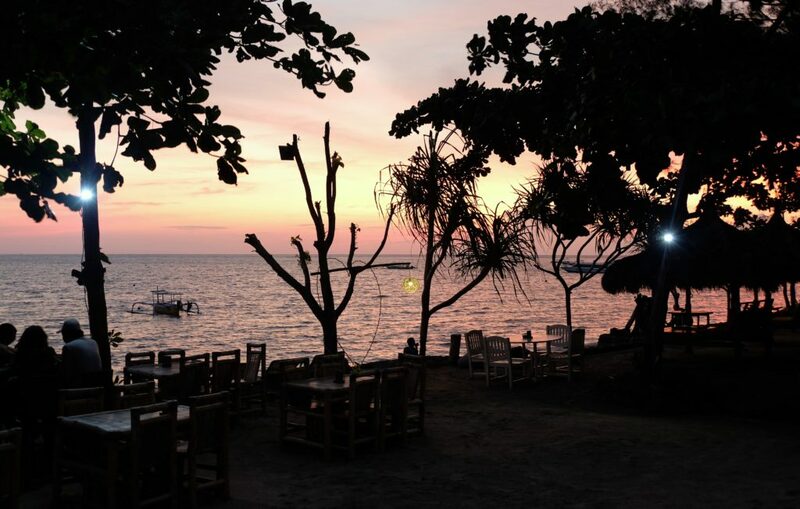 Considering their locations (travelling from Lombok to the Islands – East to West) with Gili Air closest to Lombok, Gili Meno in the middle and then Gili Trawangan the furthest (yet not far away in reality), they have developed unusually. 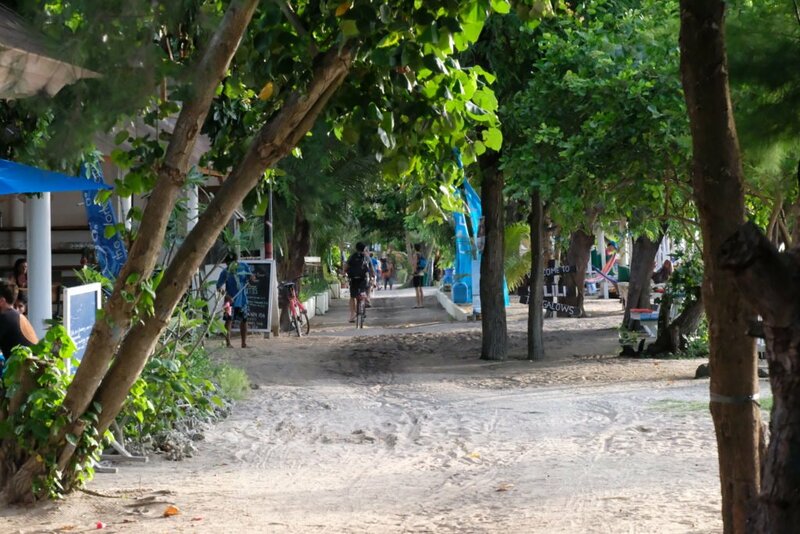 Gili Trawangan is by far the most commercial, where you will find stereotypical holiday resorts and comforts you would expect from a developed holiday destination. Gili Meno the smallest, is very underdeveloped, you are more likely to find bamboo hut accommodation with an artistic hippie vibe. 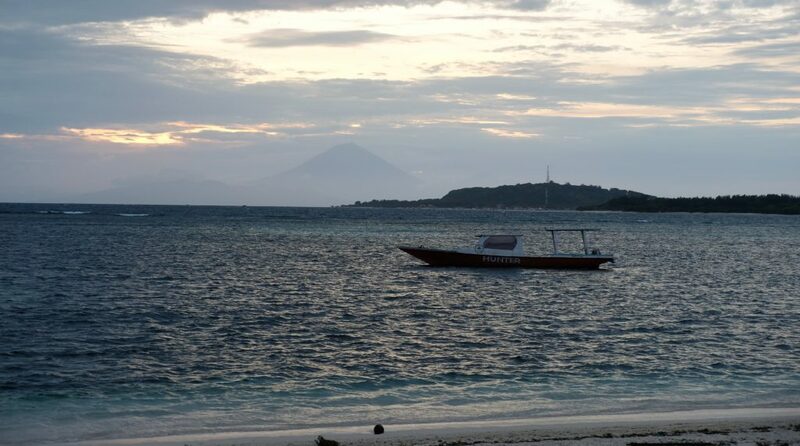 Gili Air is the in-between island; no hotels but with a variety of accommodation very similar to Amed Beach. The few double story buildings are nearer the ferry port with shops below and accommodation above. There are some bargains for basic accommodation and average prices for a place with a swimming pool. Gili Air reminded me somewhat of Dahab; accommodation and their respective restaurants are separated by a road which runs around the island. I use the term “road” loosely, nothing is tarred except right by the ferry port. Anything resembling a road is more down to the hotel/accommodation paving the area between their accommodation and their restaurant, the rest is a sandy-dusty path. Whilst there I got to know one of the owners (two Aussies and an Italian) of my accommodation Bel Air Resort & Spa. He told me that the government had clamped down on building regulations and after many years have set a deadline for all restaurants on the beaches to be moved to within the accommodation area (hope that makes sense). Many places have already complied, others were busy demolishing theirs to integrate their restaurants & bars on the other side of the road. I think this is a good idea, no doubt most places if not all just annexed the beach opposite their properties, some more stylishly and safely than others. The new law will certainly give the beach a cleaner look and simultaneously create more beach too. Shew that seemed very long wounded to say something very simple. Gili Air is a quiet island, no cars or motorbikes. Transport consists of walking, bicycles or horse-drawn carts – the motorbikes you will see are all electric. Gili Trawangan is the biggest island at 2km/3km, Gili Air is the second biggest, it took me just over an hour to walk around the circumference at a slow pace. 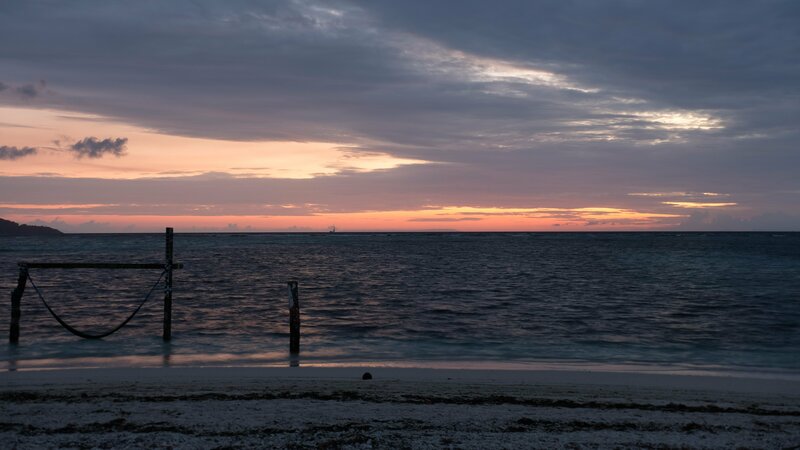 Gili Air is where you come to relax, there isn’t much to do except tan, swim, snorkel and dive – I couldn’t do the latter with a mild ear infection but that really didn’t bother me. 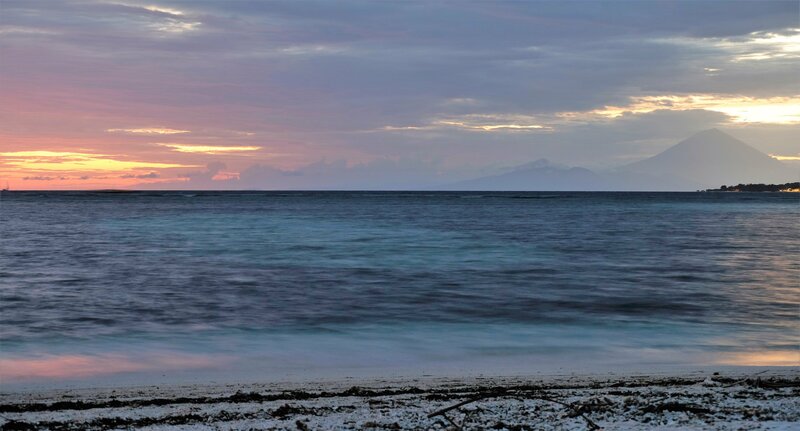 Although Gili Air is unmistakably busier than Amed Beach, life here moves at a glacial pace, blissful. I got into a rhythm very easily, wake up, have some breakfast and strong coffee, then go snorkelling. Get back do some chilling by the pool and mix it up with some writing, then go for an afternoon snorkelling session. Back to the pool for chilling and writing, maybe more chilling and a swim in the pool. Late afternoon swim in the sea or pool just to mix it up a bit then head off to the West beach for some sundowners. That pretty much sums up my time on the island, every now and then I would go for a walk, I must have walked around and through the island a dozen times. I could easily have stayed on Gili Air much longer, I felt totally comfortable and at home; not wearing a shirt is not something I often do, but here I hardly wore one. Eventually, as in most places if I stay a while, I get anxious about not keeping momentum so that is really the only reason I stayed a week. I’d say my only criticism is some of the tourists visiting from the mainland Bali/Lombok and Gili Trawangan who come over to snorkel can become irritating for a few reasons. 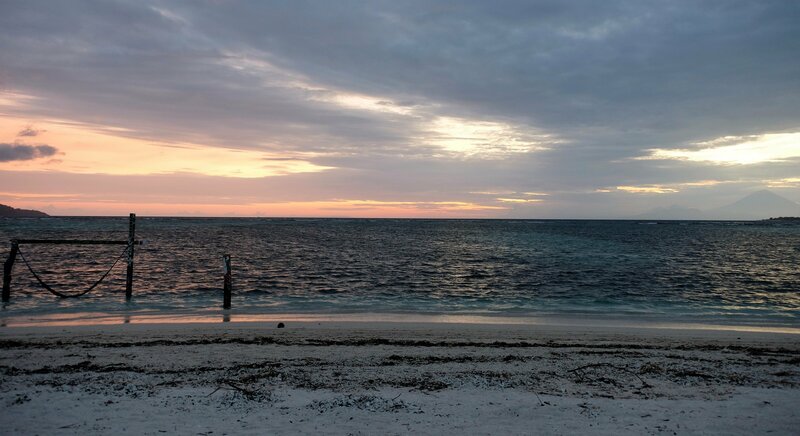 They tend to visit just the one area near Sunrise Resort (fantastic marine life) so you can avoid them or go in the morning or late afternoon. My irritation is twofold, firstly they arrive in large numbers splashing about and making such a noise that they chase a lot of the fish away. Secondly, I kid you not, many can’t swim properly or swim at all; they must wear life vests/jackets or else they sink, it’s bloody ludicrous! Oh, I’m not referring to kids that can’t swim. The ensuing mess results in groups of people splashing about bumping into everyone and everything, yes, and chasing all the fish away. I really think there needs to be a more thought out solution between driving tourism, safety and protecting the marine life. I don’t mean to sound like a like a grumpy old man. For the best snorkelling, the East coast is by far the best. 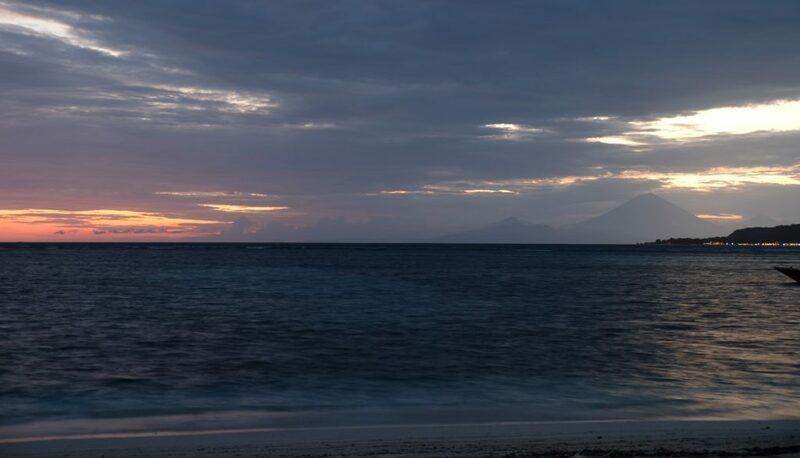 Anywhere from Sunrise Resort right to the tip of the North East, by Gili Air Resort. 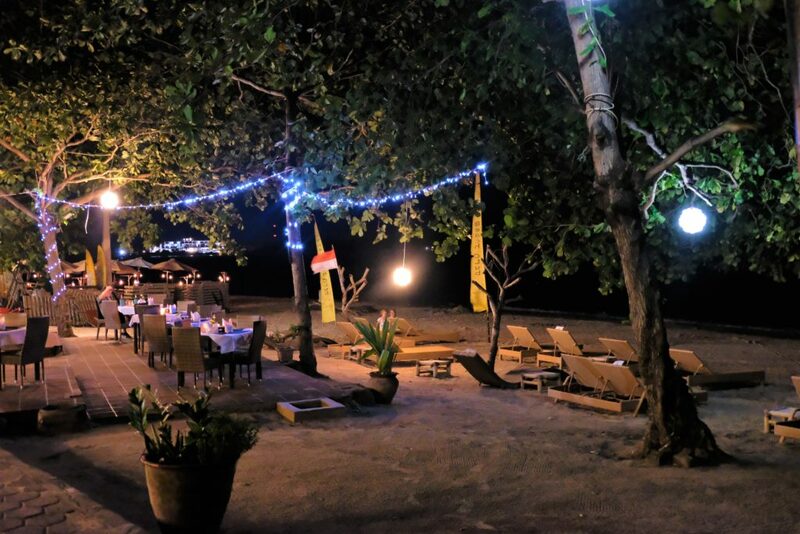 For Turtles I found the North East the best around Sandy Beach Bungalow Bar & Restaurant. I don’t want to understate how badly the coral is damaged, but there is still beauty to be seen in these waters. From various eels, lion fish, loads of different puffer fish and so many others that fill areas with all the colours of the rainbow and near any shape or size you can think of. I was lucky enough to swim with turtles four times, on two occasions spending almost half an hour with them, at a distance, watching them eat the algae then majestically gliding off to find more algae – they are so graceful in the water. On the marine life, there is plenty, don’t get me started on not having a GoPro, I have one now, too late for Indonesia ☹. No underwater pictures aside, the variety of aquatic life is beautiful, not as much as the Red Sea nor parts of Thailand but still stunning in every respect. Going North on the East side of Gili Air is quieter, not as much fish but a greater chance of spotting turtles, which I did a few times – that is a privilege. There are coral reefs, truthfully, they have taken a battering especially from the East of the Island heading North, where you’ll find more dead coral than live. Some areas covering many football pitches lie dead, strewn across the seabed like burnt-out coal all white and grey. It’s a sorry sight to see. With crystal clear water the barren coral is more evident. I immensely enjoyed the sea around Gili Air, there is still a plethora of sea life, but you cannot escape realising just how much of the marine life is now dead. To put it into perspective, for every tennis court size area filled with life (still with patches of dead coral) there must be two football pitch areas that are dead. I heard further into the sea between the islands it isn’t as bad, my concern is how long till they are not affected too. I struggle to explain the devastation, it is made worse by what dead coral looks like; stone like plants, the colour that can only happen when all life has been sucked out of it. It breaks easily scattering the sea floor like dead leaves during the height of Autumn, except they will no regenerate on the trees when Summer arrives. Maybe the best description is the site after a forest fire, again, the difference is the coral once gone does not come back, as is with the rest of the marine life. 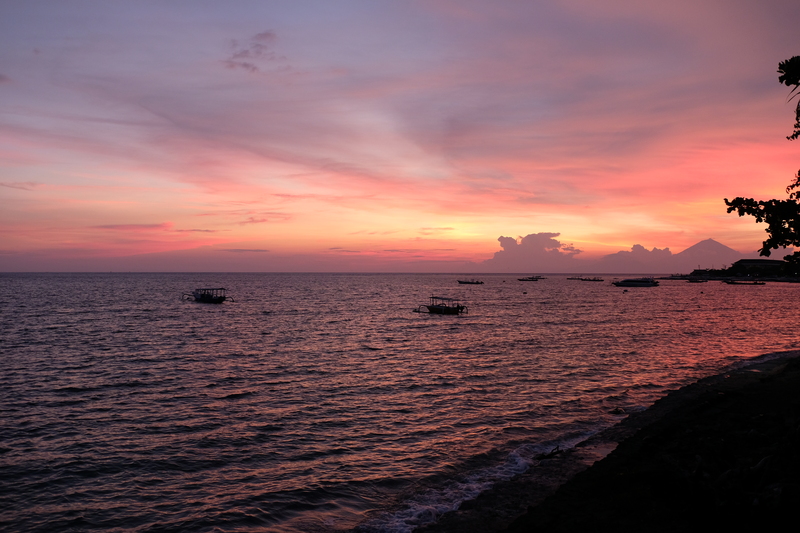 Contrary to what it may seem, I don’t have much to say about my time on Gili Air. I doubt you’d like to hear about me lying in the sun, walking around the island dipping into the sea when I got hot, that’s about all I did. As for sunsets, most nights I’d go to the West coast (20 minutes’ walk), buy a mojito…or two, and watch the sun set, they are magnificent. 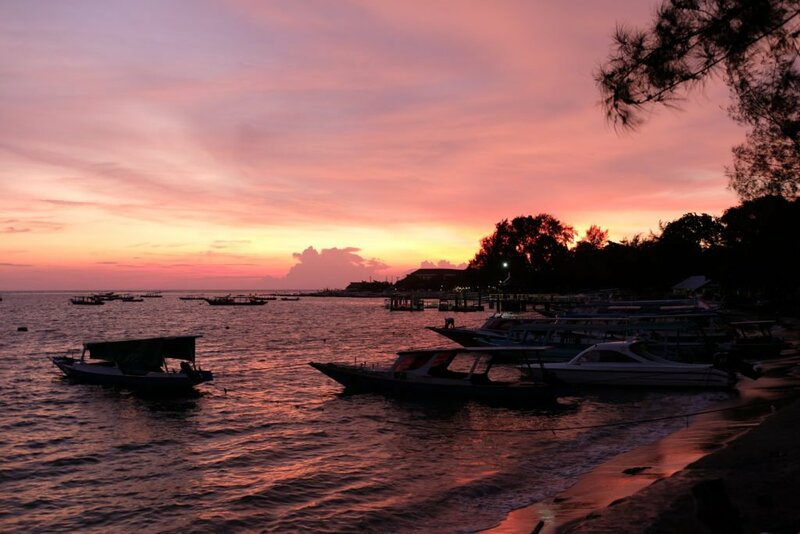 With the sun turning the sky a fiery array of red, orange and yellow, mount Agung in the distance and the sea brushing against the white coarse sand…that’s not a bad way and place to end an arduous day. I’m conscious of waffling on with very little to say. 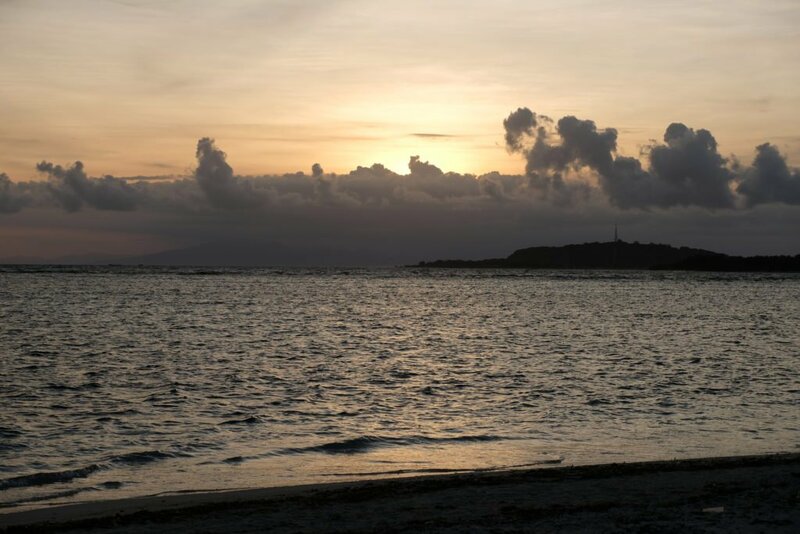 I’d go back to Gili Air tomorrow if I had the opportunity, I hope so. Next stop would be Lombok, similar start to Bali, with a great ending.